We will discuss the general pedagogical and technical issues in the design and use of video for analysis and modeling, coupled with interactive simulations, anchored on the Framework for K–12 Science Education. Participants will work in teams, and be mentored on a meaningful task of their choice, to create curriculum materials (such as videos, video models, & Ejss models). All curriculum materials created would be cataloged on the Singapore OSP Digital Librariesand/or ComPADRE.org/OSP Digital Library. Participants are encouraged to bring their own Windows/MacOSX/Linux laptops with Tracker(installed) and EjsS(unzip and run) in working order. We invite interested educators to register your interest here. For details please visit this link. PS: We also have 2 other related workshops that can be signed up via https://traisi.moe.gov.sg/. NRF2013-EDU001-EL017 invites 2 professors to Singapore! We will discuss the general pedagogical and technical issues in the design and use of video for analysis and modeling, coupled with interactive simulations in light of the Framework for K–12 Science Education http://www.nextgenscience.org/framework-k%E2%80%9312-science-education . Participants will be mentored on a personally motivating task to create curriculum materials (a series of video, video models, Ejss models etc ) and its distribution mechanisms associated through shared Libraries etc. Participants are encouraged to bring their own laptops with Tracker installed and test run the EjsS authoring and modeling tool. Beginner’s workshop on the use of Tracker. 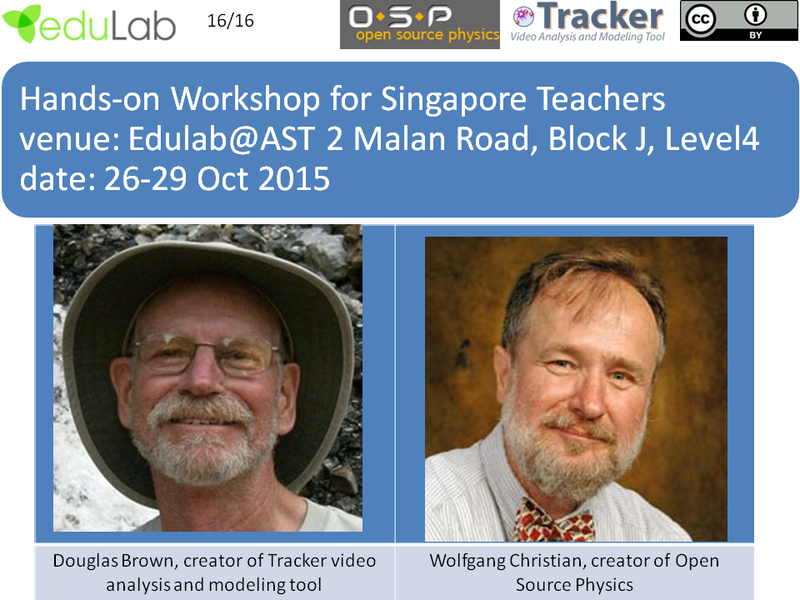 Overview of ComPADRE, Open Source Physics OSP, OSP@SG and Tracker resources. Introduction to Tracker video analysis, creating and importing video clips, and data analysis using Tracker (projectile motion). Formulate personal curriculum development objectives. Group Project: Barbie (aka Water Bottles) Bungie.